As the fourth edition of the Perini Navi Cup approached, the captains and owners of Perini-built superyachts prepared for battle in the idyllic environs of Porto Cervo, Sardinia. Organised by the Yacht Club Costa Smeralda (YCCS), the regattas have been held in 2004, 2006 and 2009, and participants eagerly awaited the 2011 event, held 1 to 4 September. 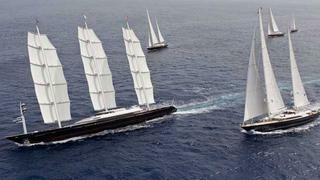 Thirteen Perini Navi giants surged past the to the starting line off Porto Cervo on the first day of the Cup. They raced for about 21km through the strait between the mainland and Isole delle Bisce, before turning north around Monaci island and then home. As nine knots of easterly breeze built to 12 knots by the end of the race, 54-metre Parsifal III whizzed ahead to become the fastest yacht in real time, finishing in just over one hour and 41 minutes. She came in second on corrected time, however, with 88m Maltese Falcon leading the overall classification. A westerly breeze of about 13 knots greeted yachts at the starting line on the second day of the Cup. The fleet followed a 39km course rounding Monaci island to the north, then on to Secca Tre Monti rock and Capo Ferro. As the wind changed direction and fell, the superyachts sailed south to Mortoriotto and dashed for the finish line off Porto Cervo. The 56-metre Panthalassa was victorious, leaving the Cup’s top three yachts separated by just one point. Frustratingly for those awaiting the deciding action, racing was abandoned on the final day of this year’s Cup due to light and unstable winds. As it was, Maltese Falcon took overall victory despite being tied on points with the Parsifal III, because she had gained a bullet in the first race. The 88m yacht has won the last two editions of the Cup. Panthalassa came third. The next YCCS regatta is The Maxi Yacht Rolex Cup, 5 to 10 September.